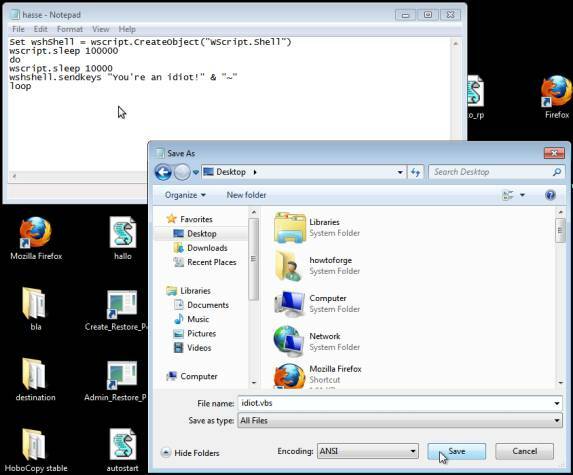 Visual Basic Script is a simple scripting language you can use in Windows to compile executable .vbs files. They can be created with a notepad document, save the script by choosing All files in the Save as type drop-down menu and give it a name ending with .vbs (if you leave the first drop-down menu on text-document, notepad will attach an invisible text-document suffix on the created file, no matter if you say so in the document name). Now to the scripting VBScript can be used to either ease the use of Windows (as seen here) or to prank the hell out of your friends' computers. MsgBox "Text goes here! ",extracodes+go+here,"Title goes here!" MsgBox "Hello hello, I'm a message box with a critical Error! ",2+16+4096,"Critical Error"
Replace number with an amount of milliseconds to wait.